To be sympathetic, compassionate and humble. To be a blessing to others. If there ever was an oath of office for the members of Hospice, its origins are 2,000 years old. The admonitions of Peter are the very foundation upon which Hospice is built upon. On the evening of October 23, 2014 Community Health Professionals (CHP) Hospice presented their first annual Beacon of Hope banquet and fundraiser at the Bryan Eagles. On the evening of March 20, the Archbold Evangelical Church played host to the CHP Beacon of Hope banquet and fundraiser for Fulton County. The goals and the format were very similar, but the most important similarity was basic…the need. From the day that we take our first steps onto the stage of life, physicians are charged with the daunting task of making sure that their we spend as much time upon that stage as possible. Most of the time it is just a bump, bruise of a bad case of bronchitis that the doctor contends with. Sometimes though, that physician puts in a call for a patient to come in for a consultation. A test result has detected something, and the news is not good. For the patient and their family, the stress levels due to anxiety and fear immediately begin to climb. Upon arrival, the patient and the family are greeted by a somber physician who has to break the news…the condition is bad, and is beyond the capabilities of human medical knowledge to reverse. The patient is given the news that he, or she, is dying…and there is nothing that can be done. Two days ago, there was nary a care in the world…life was good. Then came the phone call, and although the following day was full of apprehension, hope still prevailed. Now…like a slow-motion train wreck that never seems to end, emotions are colliding into each other in a cacophony of confusion. In a matter of hours, ‘together for life’ has suddenly been given a new, heart-wrenching course for the patient and family…a time limit. Critical or life-limiting medical conditions can strain or rend the fabric of even the strongest family ties. The physical, emotional and spiritual strains that come with such situations can be as taxing to the family and friends that have become caretakers, as they are to the actual patient. It is here that Hospice steps in to ease the stresses upon both the patient and the caretaker. The Patient Care Fund is the big recipient of the Beacon of Hope fundraising event. According to the CHP Annual Report for 2013, 72 percent of their income came from Medicare, 15 percent from patient services and 13 percent from donations. With the constantly shifting rules and regulations in what is called the Affordable Care Act or Obamacare, there is always room to improve the safety net for CHP Hospice. As Krista explained, “There are still some out there without insurance,” Krista said. “Some have limited Hospice benefits. They may have just a few thousand dollars in a Hospice benefit, not an unlimited benefit. Hospice care can be expensive. The very last week of life is the most expensive week. We have daily, maybe twice daily nursing visits…it depends upon what is needed. We use a lot of medications to keep patients calm and pain-free. Whatever equipment they need, we’re taking care of all that.” The funds raised during the Beacon of Hope event helps fill in the blanks left behind by insurance shortfalls. There are important things that Krista wants the public to know about CHP Hospice and its benefits, and they all center around timing. “It’s about sooner than later. People are scared by the word ‘Hospice’. They think that it means the last week of life. We try to get the word out that we actually see people for weeks and months. The sooner we can get in, the more services we can avail to them, the more care we can give to the family, the more that they can come to trust us. It’s so that in the middle of the night, if they call us at 2 a.m. for symptom management, we’ll be there. We’re the eyes and ears of the physicians, so it’s really helpful for people to know that they’re not going to have to go back to the emergency room. What do you do though? Before Hospice, what do you do if you’re really sick? Sooner than later would be really helpful.” It may be difficult or painful to call CHP Hospice for help through an emotional hurricane, but that call will be the first step to easing a burden that you may well believe will crush you into powder. It’s what they do…and they are without equal at what they do. With the task of fundraising at hand, a silent auction was once again featured, with the special feature being a live auction being handled by auctioneers Terry Short, Rick Kigar and Keith Seiler. As he did in the earlier event in Bryan, Rick Small of Mix 98.1 took over the emcee position with polish, energy and a boatload of humor. Nowhere was that more apparent than when Small announced the auction of a ground cherry pie, baked and donated by Ms. Grace Eicher. Asking Ms. Eicher to stand and be recognized, he left the stage with the microphone to talk with her. When she said that she was 90 years old, he said, “You’re 90 years old? My gosh, sit down. 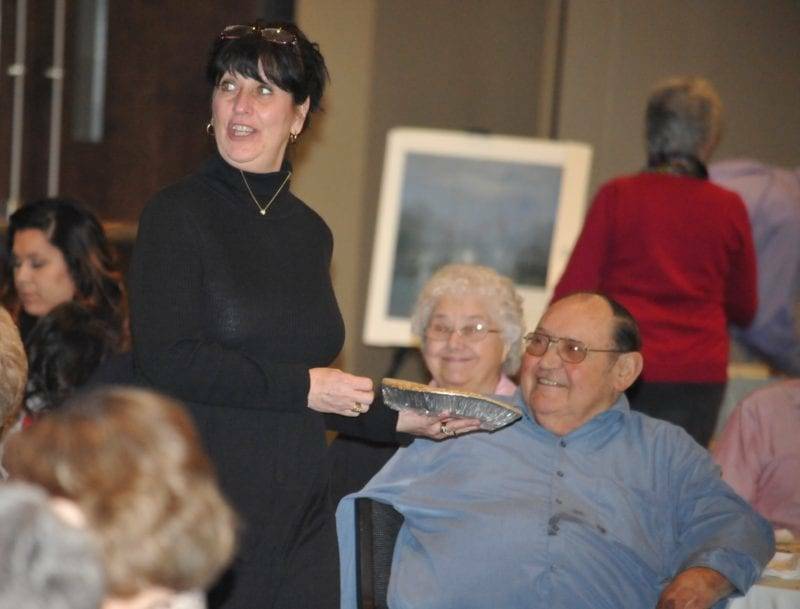 Amazing Grace…90 years old and making pies!” He asked the audience for a round of applause for Ms. Eicher, to which the audience was quick to respond. Fundraisers are generally not famous for high quality entertainment. A CHP Hospice Beacon of Hope event is on a different plane though. They put the ‘fun’ in fundraising, with a cause that is unimpeachable. Think about that last statement, then refer back to the opening reference of I Peter 3:8-9. The admonition, in a nutshell, was to behave a certain way, and be blessed. Can you name one organization other than Hospice that holds fast to all that Peter asked…and yet it is the recipient that also receives the blessing? It is for that reason that the Beacon of Hope events are so very important. When the time comes, everyone, regardless of status, should have equal and full access to this service. To inquire about CHP Hospice services, or to donate to their incredible cause, contact the CHP Archbold office at 419-445-5128. © 2015 – 2018, Tim Kays. All rights reserved. Be the first to comment on "CHP Hospice Beacon Of Hope Fulton County Banquet As Educational As It Was Enjoyable"